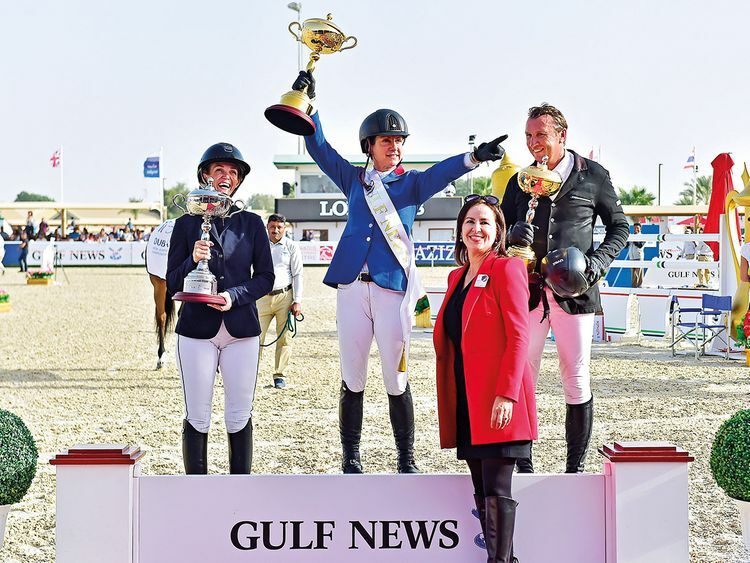 Dubai: Alice Debany fought through the pain barrier to complete an emotional victory in the Dh112,000 Gulf News Cup CSI 5* W Class, one of the highlights on Friday afternoon’s action at the 2019 Dubai Show Jumping Championships. Debany, the Dubai Show Jumping team coach for the last 14 years, delivered a courageous and faultless performance aboard her horse, Amareusa, to win the jump-off in an impressive time of 38.6 seconds. I was [also] attacked by a sciatica nerve pain last week and I was on crutches, and the only time I am not feeling pain is when I am riding. Only four seconds slower and bagging second place was Jorg Naeve, a professional trainer for showjumping horses in his native Germany, aboard HH Fleur, while Tina Lund of Denmark clocked 39 seconds for third place aboard the 14-year-old Freestyle 39. The jump off is an abbreviated and more difficult and normally faster version of the original course. Of particular significance for the riders were the valuable Longines ranking points on offer in the Gulf News Cup. Debany explained why Friday’s win was extra-special to her. “I broke my leg catastrophically in May 2017, and I will always walk improperly on that leg,” she said. Debany, who juggles participating in competitions along with her day job as a professional coach, said she was delighted with her win. “It is unbelievable to win at home,” she said. “This is our home grounds, I got to ride in front of all the crew members, all the ladies that take care of the stables, all of my bosses at the Equestrian Club, and all of my riders my students who have been with me for 14 years. “I am very proud of my horse, for finding the heart to win that class. I believe winning breeds winning, and I hope to show by example and it is what I have always tried to do,” Debany added. Day 3 also featured the Dh389,000 Azizi Developments Golden Cup. Held under the supervision of the UAE Equestrian and Racing Federation (UAEERF), the four-day show will conclude on Saturday with the Emirates Airline Dubai Grand Prix that not only offers a total purse of 145,700 euro but is also one of the qualifiers for the Show Jumping World Cup. More than 100 horses from 28 different countries around the world have been participating in the event.